Ministers have changed a controversial early release scheme after admitting two terrorism convicts were let out of jail early to ease prison overcrowding. The justice ministry said people convicted under terrorism laws would no longer be eligible for early release. Yassin Nassari left Wakefield Prison in February after being jailed last summer for three and a half years. The BBC understands the second man was Abdul Muneem Patel, released from Glen Parva prison on 7 January this year. 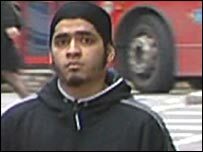 Nassari, 28, from Ealing in west London, was arrested in May 2006 at Luton Airport carrying what police said were blueprints for a rocket in his luggage. 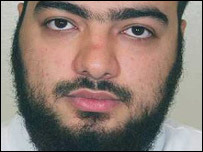 He was convicted in July 2007 of having articles of use to terrorists. Scotland Yard detectives had arrested him after he arrived on a flight from Amsterdam. They found a computer hard-drive in his luggage including documents about martyrdom and weapons training. They also found a blueprint for a home-made Qassam rocket, used by Palestinian militants to target Israel. 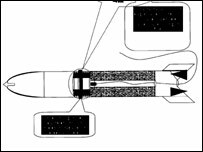 Experts told his trial the blueprint was detailed enough to manufacture a rocket. Detectives also linked Nassari to extremist websites and chatrooms. 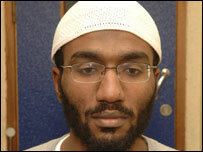 Patel, of east London, was jailed for six months at the Old Bailey in October 2007 after a jury found him guilty of having a terrorism-related explosives manual. The judge said there was no reasonable excuse to have the manual - but added the teenager was not a "radicalised or politicised Islamist". Under the terms of the government's special early release scheme to ease overcrowding, prisoners are eligible to leave prison 18 days earlier than normally expected, if they had been jailed for less than four years and not committed a serious violent offence. Earlier on Friday, a spokesman for the Ministry of Justice confirmed that a Category A prisoner had been released from Wakefield prison on 11 February because he met the criteria for early release. Nassari would have been eligible for release 17 days later, having served enough of his sentence to be considered for parole. But the ministry later announced that Justice Secretary Jack Straw had now banned all prisoners convicted of terrorism offences from benefiting from the early release scheme. The spokesman denied the previous policy was a mistake but confirmed that a second man convicted of a terrorism offence had been released under the scheme. "The number of terrorism-related cases likely to fall within the current criteria is very small," said the spokesman. "However, in the light of these cases the justice secretary has decided to change the criteria so that any prisoner convicted under terrorism legislation would not be eligible." But Shadow Home Secretary David Davis said: "Jack Straw must now say when he knew about this, and why he has only just acted. Were these men released with or without his knowledge? "The Government's perverse approach to security defies common sense. On the one hand, they are trying to pass a new law extending the period for holding innocent people - convicted of nothing - on the other hand, they are releasing a terrorist we have managed to bring to Justice." Separate Prison Service rules, issued in February, had already banned prisoners convicted of terrorism offences from being released early on an electronic tag. Nassari's offence was one of those listed in the new rules. However, at the time it did not preclude him from being released under the special rules for over-crowding. Harry Fletcher, Assistant General Secretary of the National Association of Probation Officers, said that the scheme had not been properly thought through and had already led to men who were convicted of domestic violence offences being set free early. "To learn that people associated with terrorism are also coming out is clearly appalling but isn't a surprise," he said.